“I could not put it down! 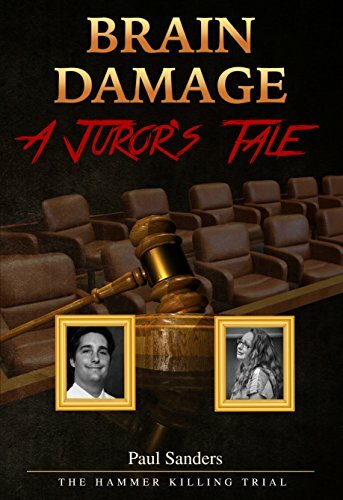 It is a great read for the ‘True Crime Junkie’…Paul Sanders didn’t miss a beat!” The true story of the death penalty trial of Arizona’s ninth most deadly woman, Marissa DeVault as told by deliberating Juror #13. ‘Brain Damage’ was also featured on Investigation Discovery’s True Crime Series, ‘Deadly Sins’ with Darren Kavinoky, titled ‘Until Lust Do us Part’. Paul Sanders was a death penalty juror for Marissa DeVault, ranked Arizona’s ninth most deadly female killers. He went on to write three books on the world’s most sensational trials including that of Arizona’s most deadly woman, Jodi Arias. His compassion for the victims and their families throughout each work separates him from the typical true crime author.